Although quality of life is recognised as a key area of research when assessing development, it has received little attention when studying disability in South Africa and other developing contexts. As a result we know relatively little about how people with disabilities living in developing contexts fare in comparison to their counterparts without disabilities. In this article we seek to address this gap. We draw on secondary data analysis of a national panel study to compare the outcomes of people with disabilities and those without on measures of objective and subjective indicators of quality of life. 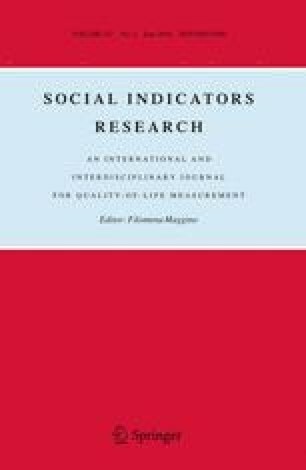 We demonstrate that on subjective indicators of quality of life, people with disabilities consistently fare worse than those without disabilities, but that these differences are related to a range of variables. This means that we need to understand the intersection of disability with other factors such as gender and age in assessing quality of life. Following this, we argue that investments in national scale interventions such as increased access to basic amenities and social services represent investments in capability enhancement. As a result such interventions have the potential to address the needs of all, including those with disabilities, and to substantially enhance their quality of life. The study was supported by a grant from the Australian Department of Foreign Affairs and Trade (DFAT) number 58766. This study was a collaborative initiative between DFAT and the Centre for Social Development in Africa, University of Johannesburg. However, the views expressed and information contained in this report are not necessarily those of or endorsed by DFAT which can accept no responsibility for such views or information, or for any reliance thereon. The study upon which this article draws was conducted by a team of researchers. We would like to acknowledge Ms. Jacqueline Moodley, Dr. Edson Munsaka, Ms. Zenobia Ismail, Dr. Marguerite Schneider and Dr. William Rowland. Particular thanks to Jacqueline Moodley for her critical reading and feedback on drafts of the article. Ardington, C., & Case, A. (2009). Health: Analysis of the NIDS wave 1 dataset. National Income Dynamics Study. Discussion Paper No. 2. www.nids.uct.ac.za/publications/discussion-papers/wave-1-papers/98-nids/discussion-paper-no02/file. Accessed April 8, 2013. Burns, J. (2009). Wellbeing and social cohesion: Analysis of the NIDS wave 1 dataset. National Income Dynamic Study. Discussion Paper No. 7. www.nids.uct.ac.za/publications/discussion-papers/wave-1-papers/98-nids-discussion-paper-no07/file. Accessed June 23, 2013. Noll, H.-H. (2013). Subjective social indicators: Benefits and limitations for policy making—An introduction to this special issue. http://link.springer.com/article/10.1007/s11205-013-0379-7/fulltext.html. Accessed April 16, 2014. Organisation for Economic Cooperation and Development (OECD). OECD Economic Surveys South Africa. (2013). http://www.oecd.org/eco/surveys/South%20Africa%202013%20overview%20FINAL.pdf. Accessed May 21, 2014. United Nations. (2006). Convention on the rights of persons with disabilities. United Nations. http://www.un.org/disabilities/convention/conventionfull.shtml. Accessed June 7, 2013. Warren, N., & Manderson, L. (2013). Reframing disability and quality of life: Contextual nuances. In N. Warren & L. Manderson (Eds. ), Reframing disability and quality of life (pp. 1–16). Social Indicators Research Series 52. Springer Netherlands. http://link.springer.com/chapter/10.1007/978-94-007-3018-2_1.